Implementing a hightech tax credit more than a decade ago was well-meaning and helped jumpstart the technology sector in Hawaii, but there was little thought put into measuring its costs and benefits. It will likely become a costly lesson for state lawmakers. The price tag of special tax credits lawmakers approved almost 15 years ago to spur growth in the state’s tech sector could reach $1.7 billion, according to state Department of Taxation figures. Unfortunately, a new report from the state auditor suggests the return on that investment is anyone’s guess. It’s unacceptable that the state would hand out tax credits and forego revenue without being able to evaluate whether the credits are working as intended. 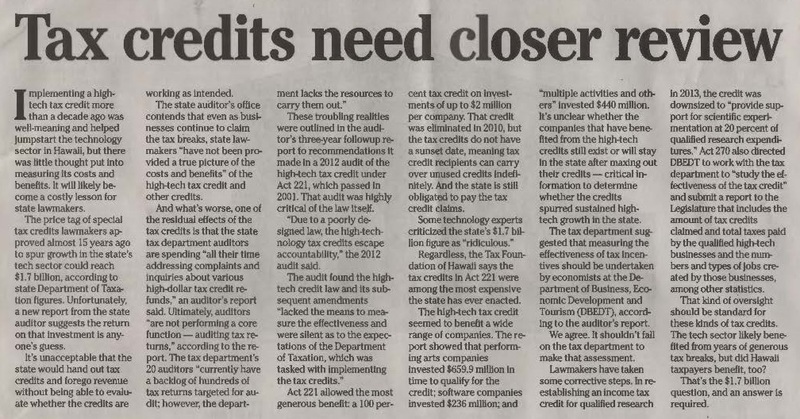 The state auditor’s office contends that even as businesses continue to claim the tax breaks, state lawmakers “have not been provided a true picture of the costs and benefits” of the high-tech tax credit and other credits. These troubling realities were outlined in the auditor’s three-year followup report to recommendations it made in a 2012 audit of the high-tech tax credit under Act 221, which passed in 2001. That audit was highly critical of the law itself. “Due to a poorly designed law, the high-technology tax credits escape accountability,” the 2012 audit said. Act 221 allowed the most generous benefit: a 100 percent tax credit on investments of up to $2 million per company. That credit was eliminated in 2010, but the tax credits do not have a sunset date, meaning tax credit recipients can carry over unused credits indefinitely. And the state is still obligated to pay the tax credit claims. Regardless, the Tax Foundation of Hawaii says the tax credits in Act 221 were among the most expensive the state has ever enacted. The high-tech tax credit seemed to benefit a wide range of companies. The report showed that performing arts companies invested $659.9 million in time to qualify for the credit; software companies invested $236 million; and “multiple activities and others” invested $440 million. It’s unclear whether the companies that have benefited from the high-tech credits still exist or will stay in the state after maxing out their credits — critical information to determine whether the credits spurred sustained hightech growth in the state. The tax department suggested that measuring the effectiveness of tax incentives should be undertaken by economists at the Department of Business, Economic Development and Tourism (DBEDT), according to the auditor’s report. We agree. It shouldn’t fall on the tax department to make that assessment. Lawmakers have taken some corrective steps. In reestablishing an income tax credit for qualified research in 2013, the credit was downsized to “provide support for scientific experimentation at 20 percent of qualified research expenditures.” Act 270 also directed DBEDT to work with the tax department to “study the effectiveness of the tax credit” and submit a report to the Legislature that includes the amount of tax credits claimed and total taxes paid by the qualified high-tech businesses and the numbers and types of jobs created by those businesses, among other statistics. That kind of oversight should be standard for these kinds of tax credits. The tech sector likely benefited from years of generous tax breaks, but did Hawaii taxpayers benefit, too? That’s the $1.7 billion question, and an answer is required. Civil Beat: Should Hawaii Spend $2 Billion To Build Homes Residents Can Afford?